The theology of the Catholic Church is based on natural law, canonical scripture, divine revelation, and sacred tradition, as interpreted authoritatively by the magisterium of the Catholic Church. The teachings of the Catholic Church are summarized in various creeds, especially the Nicene Creed and the Apostles' Creed, and authoritatively summarized in the Catechism of the Catholic Church. Catholic teachings have been refined and clarified by major councils of the Church, convened by popes at important points throughout history. The first such council, the Council of Jerusalem, was convened by the Apostles c. AD 50. The most recent was the Second Vatican Council, which was held from 1962 to 1965. The theology of the Catholic Church is based on natural law, canonical scripture, divine revelation, and sacred tradition, as interpreted authoritatively by the magisterium of the Catholic Church. 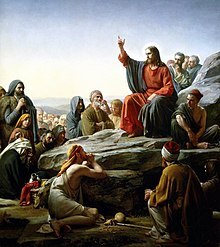 The teachings of the Catholic Church are summarized in various creeds, especially the Nicene (Nicene-Constantinopolitan) Creed and the Apostles' Creed, and authoritatively summarized in the Catechism of the Catholic Church. Catholic teachings have been refined and clarified by major councils of the Church, convened by popes at important points throughout history. The first such council, the Council of Jerusalem, was convened by the Apostles c. AD 50. The most recent was the Second Vatican Council, which was held from 1962 to 1965. The Catholic Church believes that it is guided by the Holy Spirit, and that it is protected from definitively teaching error on matters of faith and morals. According to the Church, the Holy Spirit reveals God's truth through sacred scripture and sacred tradition. Sacred tradition consists of those beliefs handed down through the church since the time of the Apostles. Sacred scripture and sacred tradition are collectively known as the deposit of faith. This is in turn interpreted by the magisterium, the teaching authority of the Church. The magisterium includes those pronouncements of the popes that are considered infallible, as well as the pronouncements of ecumenical councils and those of the College of Bishops in union with the pope when they condemn false interpretations of scripture or define truths. The first person to distinguish Catholic theology from secularism was the Italian Protestant Alberico Gentili. Formal Catholic worship is ordered by means of the liturgy, which is regulated by church authority. The celebration of the Eucharist, one of seven sacraments, is held at the center of Catholic worship. There are numerous additional forms of personal prayer and devotion including the Rosary, Stations of the Cross, and Eucharistic adoration. The Church community consists of the ordained clergy (consisting of the episcopate, the priesthood, and the diaconate), the laity, and those like monks and nuns living a consecrated life under rule. According to the Catechism, Christ instituted seven sacraments and entrusted them to the Church. These are Baptism, Confirmation (Chrismation), the Eucharist, Penance, the Anointing of the Sick, Holy Orders and Matrimony. They are vehicles through which God's grace is said to flow into all those who receive them with the proper disposition. The Church encourages individuals to engage in adequate preparation before receiving certain sacraments.